The handmade product from Java island that carved and designed by expert craftsman. It has made from best quality Teak wood and polished well in brown. Very unique and elegant. It is called as wooden trophy of soccer man. This beautifully hand-crafted usually used as award for the winner of a champion. This model is different with other model of trophy, so you can choose it for local foootball champion, school footbal, office football, community footbal and another football activity. Not only for a champion or game. Trophy also use as gift or indoors decoration. You can put it on your table in living room, office, or your library. Give the unique touch for your rooms. 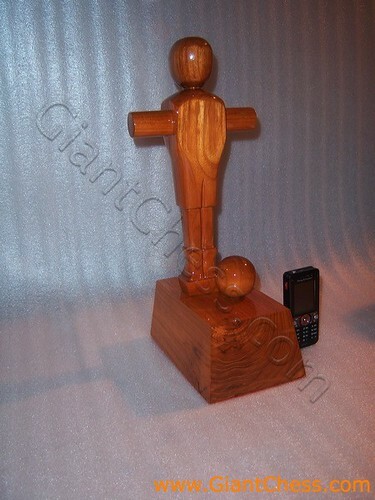 Don't hesitate, choose the wooden trophy for our trophies as an alternative to the pewter base. Trophy that made of wood has rarely to found.